While many times we think of war, especially World War II, as a dichotomy - good/evil, axis/allied, German/American - this is truly not the case. Various political goals, ideologies, and national ties often blur the lines of war. This article, using the example of foreign conscription of soldiers by Germany in World War II, seeks to illustrate this. While the Nazi Party stressed the racial purity of its members and the Germanic countries, this ideology was far from strict when it came to the German armed forces during World War II. While the party actively sought to erase various so-called "degenerate" social groups and races, the German armed forces, however, were actively conscripting foreign born soldiers of varying race, creed, and religion, thereby created a discrepancy. 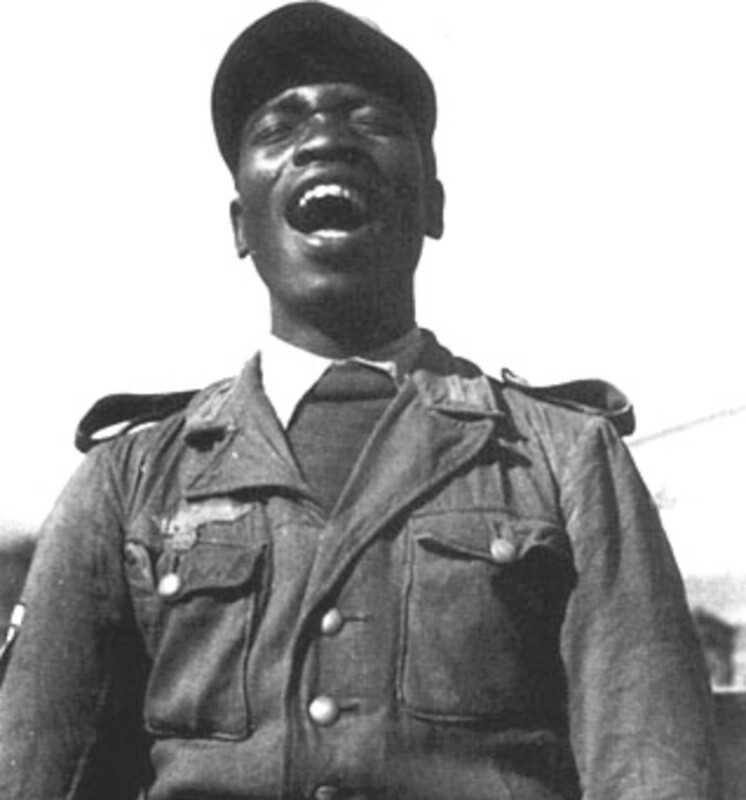 This article, exhibiting these various foreigners fighting for the German armed forces, will illustrate this discrepancy between racial policy and practice in Nazi Germany, and its extent. In the early-to-mid 1930s, Heinrich Himmler began building a separate more militaristic arm of the Schutzstaffel (SS). Called the Waffen-SS ("armed"-SS), this force was, ideally, to be comprised of topnotch and crack Germanic soldiers of racially pure Aryan blood. While the case initially, after a 1940 decree by Adolf Hitler, the German armed forces began accepting foreign born soldiers. 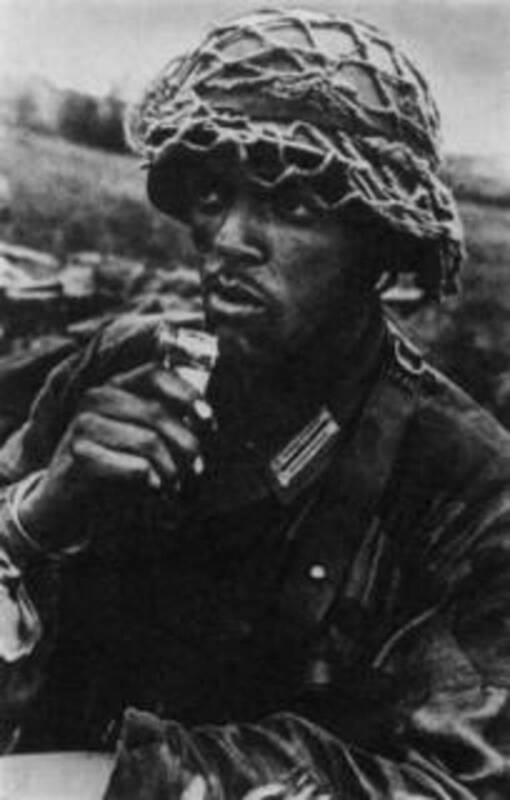 The reasons for this breakage in racial ideology are simple: as the war went on - with the German armed forces constantly decreasing, and the Allied armies ever increasing - the Waffen-SS, as well as the German Army (also to be racially pure), needed more men. Another reason was that, as the German armies began to occupy more and more countries, the Nazi High Command began to worry about the amount of military-aged foreign men forming resistance groups, and offered these men an outlet by joining the Nazi war machine. While many foreigners under Nazi control despised Naziism, they despised Communism even more, and found an outlet for this hatred in the German Armed Forces. 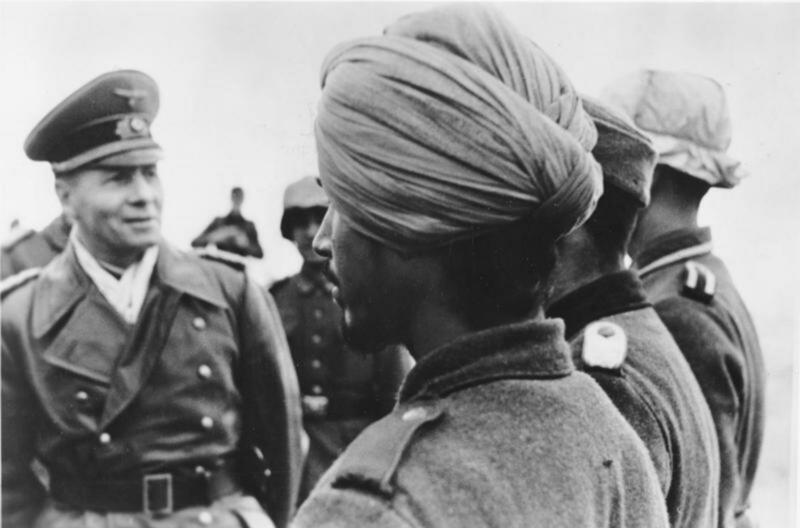 Famed German General Erwin Rommel inspecting Indian troops under his command. Note the traditional Pagri turban headdress, worn by the soldiers. 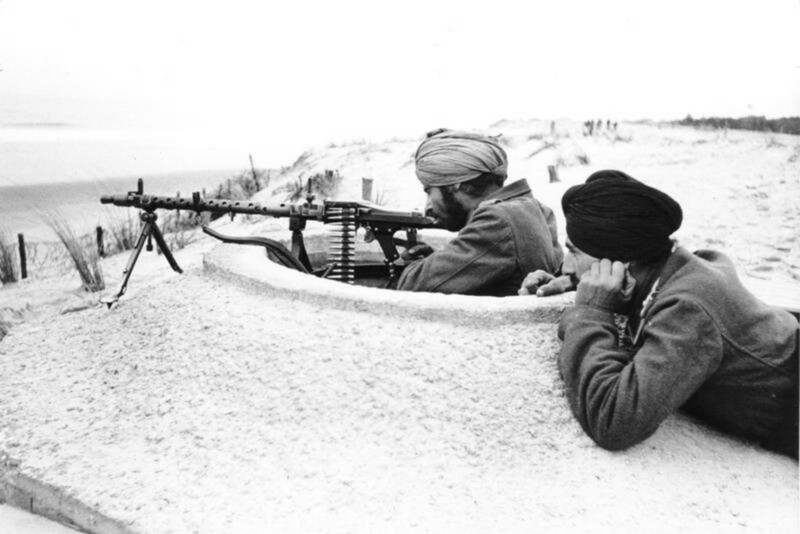 Indian soldiers of the Indische Legion, on manuevers in Normany, France preparing for the Allied landing, Spring 1944. 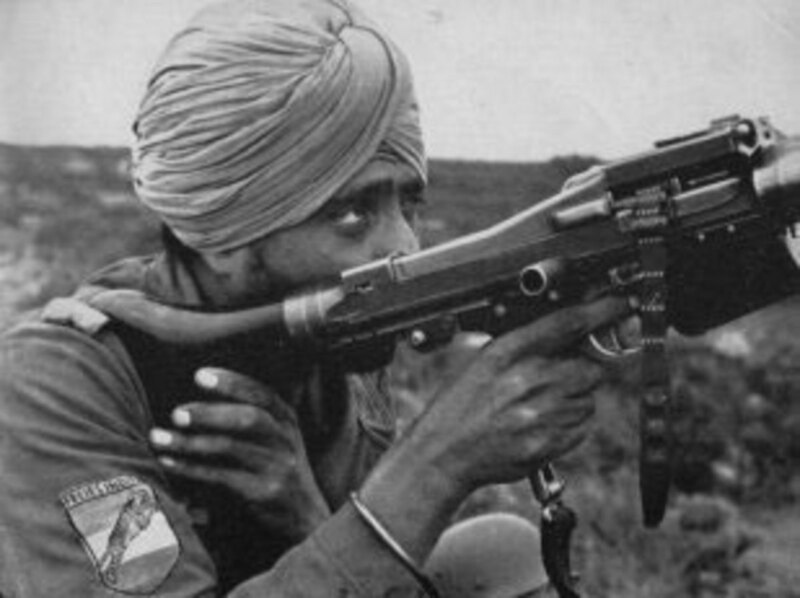 An Indian soldier using an MG42. Note the patch on his forearm - a Tiger over top the Indian national colors (a unit patch of the Indische Legion). Made up from various backgrounds, foreign born soldiers hailed from countries such as India, France, Britian, the U.S., Turkey, Russia, Korea, and China, as well as soldiers from the Islamic faith. By the wars end, the supposed "racially-pure" Waffen-SS was comprised of nearly 60% non-Germans, with 25 of the 38 SS divisions comprised of foreigners. One of the more large foreign contingents of the German Army was the Indische Legion (Indian legion), composed of Indian soldiers. As the Free India Movement developed, and the British placed a house arrest order on the Indian Congress, causing several Indian Congressman to travel to Berlin. In order to alleviate their hatred for British oppression, these congressmen formed an all-volunteer unit comprised of Indian soldiers, in the hopes of soon fighting the British in Europe and Africa. The Indian Legion initially fought with the German Army, and at war's end, the Waffen-SS. The Indian unit saw action in the Western Europe, and even fought the invading Allied force on D-Day. Muslim members of the 13th SS Division stop to pray. 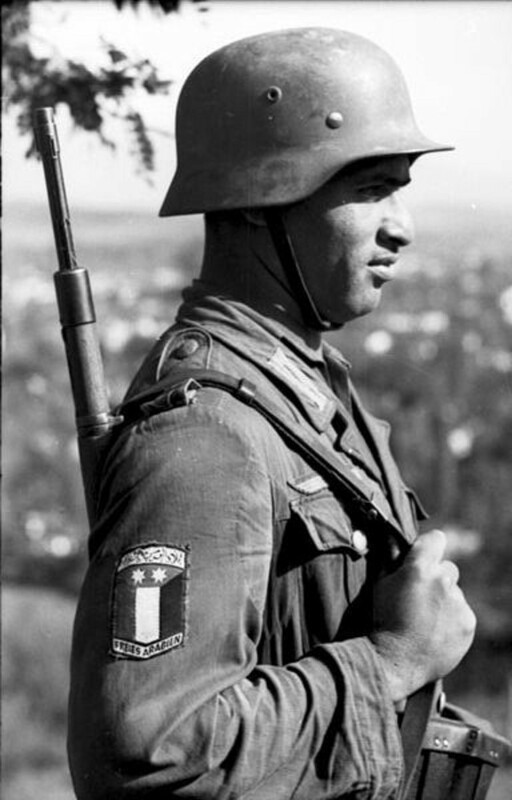 Another non-Germanic unit of the German armed forces was the Legion Freies Arabien (Free Arab Legion). As the German Army entered Africa, it began conscripting Muslim volunteers. The Free Arab Legion was comprised of Libyan and Ethiopian Muslims. Towards the end of the war, this division was folded into the 13th SS Handschar Division, composed of Muslim Bosniaks. While the division was composed mostly of volunteers, problems of dissidence often arose, when the Muslim soldiers wanted to stop combat duties during prayer time. 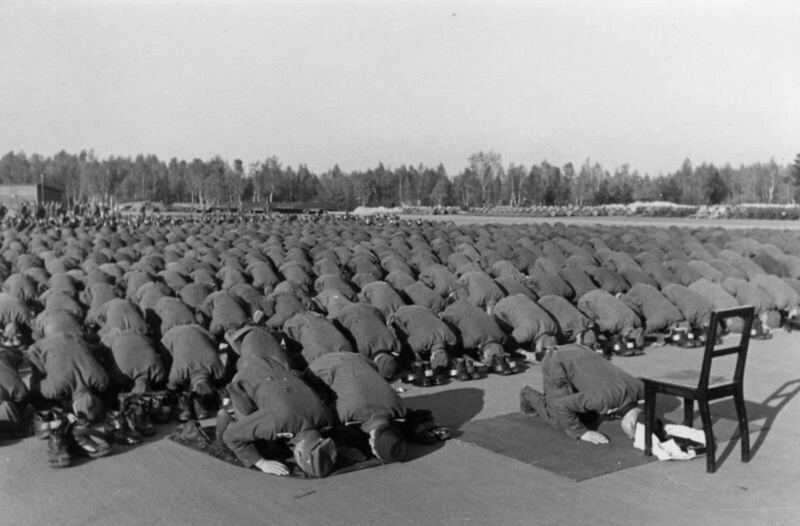 After high desertion rates, SS Commander Heinrich Himmler eventually allowed Muslim soldiers their prayer time. Interestingly, Bosniam Muslim soldiers were allowed to wear traditional Bosnian hats in conjunction with their SS uniforms. 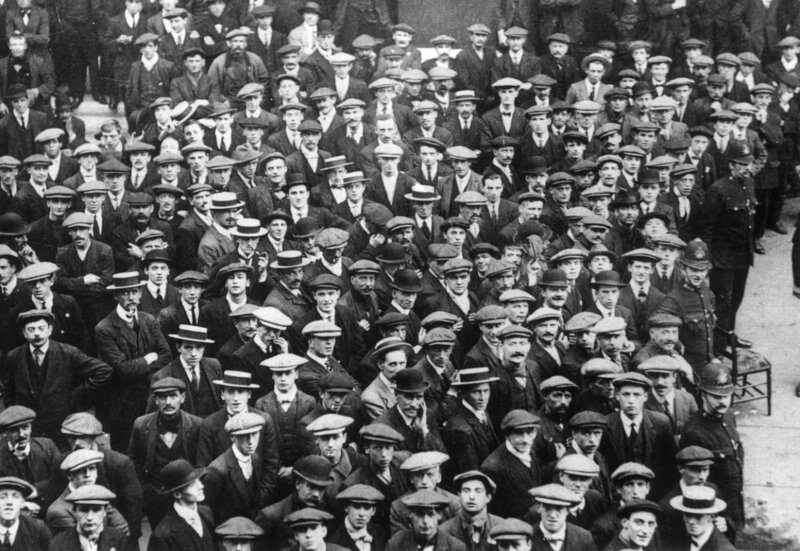 Many can be seen wearing red fezzes with the SS skull and German National Eagle pinned on. Ultimately, 20,000 Muslim volunteers belonged to the German armed forces, fighting mainly in Africa and Yugoslavia. 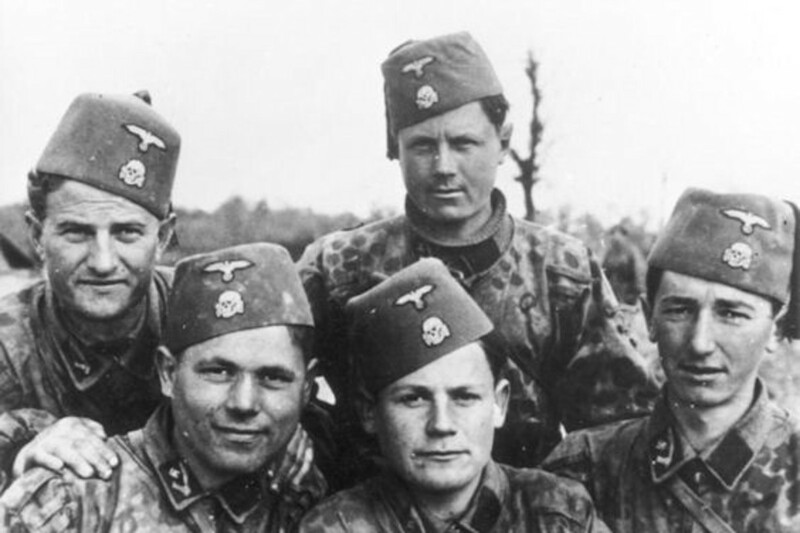 Bosnian members of the 13th SS Division. Note the traditional Fezzes (with German Eagle and Skull). Note also the middle-eastern scimitar swords their collar patches. 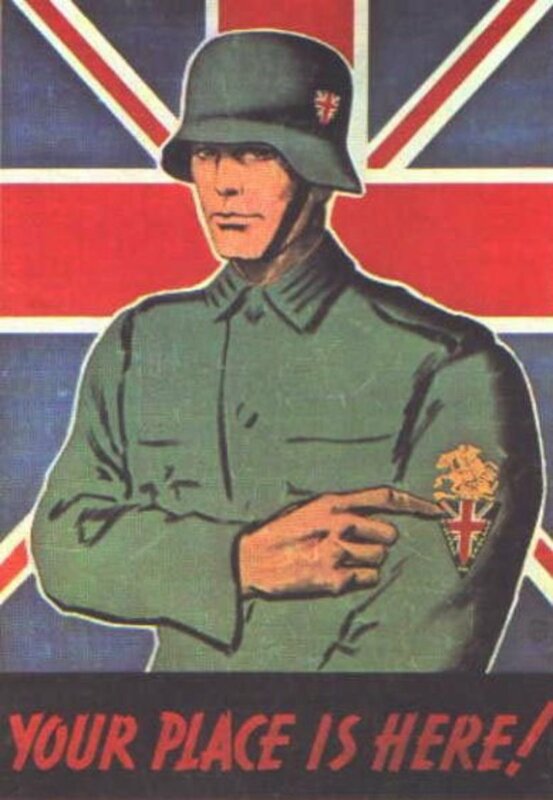 A Nazi propaganda poster, urging British men to join the German military. A French volunteer in the German Army, and a member of the Legion des Voluntaires. Note the French flag patch on his forearm. The German armed forces were no strangers to allowing French and British volunteers into their ranks. 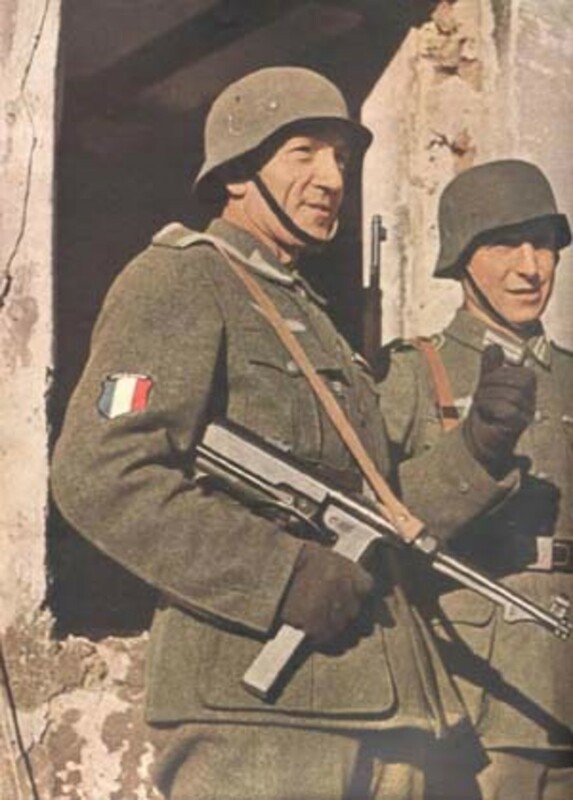 Joining mostly out of a hatred for Communism, the Legion des Voluntaires (Legion of Volunteers) was an all French volunteer unit of the German Army that hoped to fight the Soviets. They did so, as in late 1941 this unit was sent to the Eastern Front. 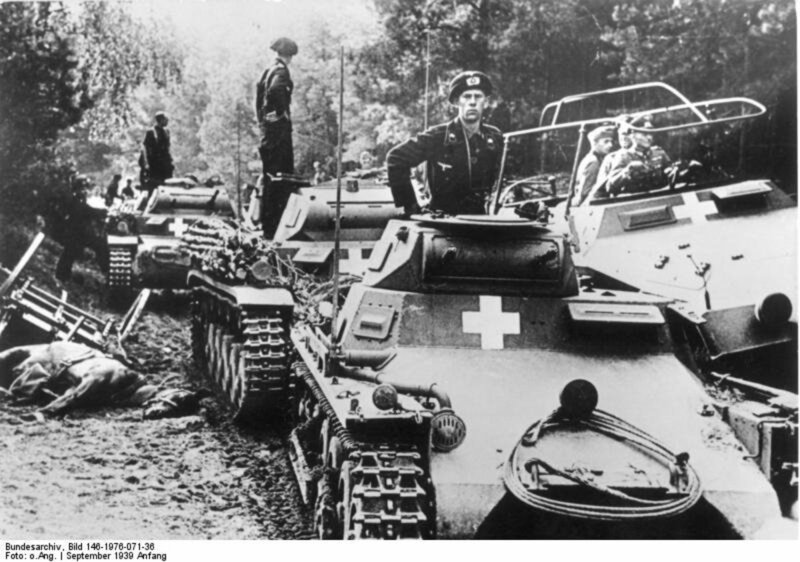 After taking heavy losses, the unit was then re-organized in to the 33rd Waffen-SS Charlemagne Division. 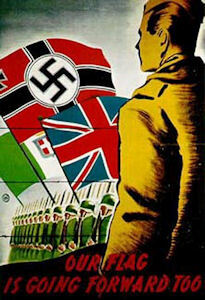 The German military also accepted many pro-Nazi British fascists, who were also looking to fight Communism. 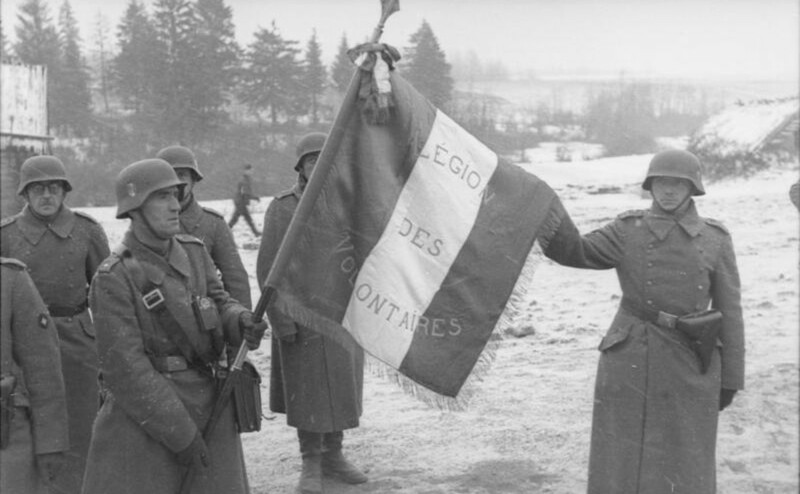 French soldiers of the German "Legion des Voluntaires" unit holding a French flag in Russia, 1941. A British member of the Waffen-SS. Note the British flag patch on his wrist. 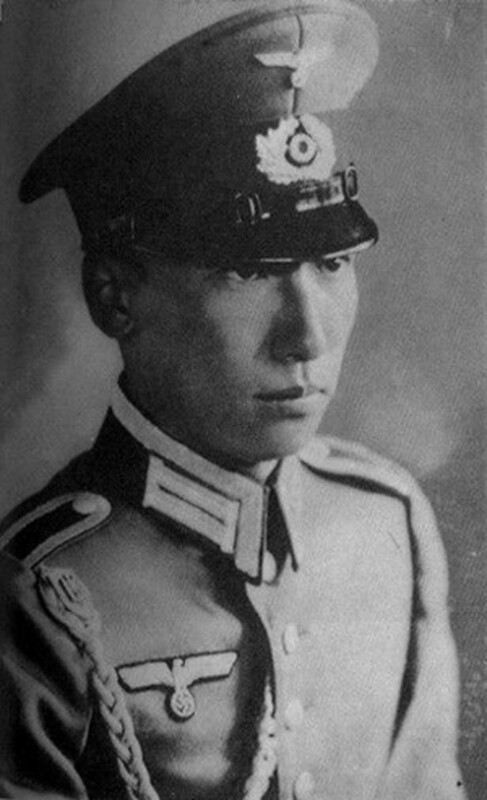 Chiang Wei-Kuo, son of Chang Kai-Shek, in his German Army uniform. Before the war began, many non-Communist Chinese soldiers joined the German military. As part of a German-Chinese friendship pact, large numbers of Chinese soldiers traveled to Germany in the 1930s, where they experienced German training. While many left before the war began, many remained, and fought in the German military, albeit in supportive roles. An interesting note - Chiang Kai-Shek (the leader of anti-Communist National movement in China) sent his son, Chiang Wei-Kuo, to Germany to train (see picture below). Chiang Wei-Kuo participated in the German military entrance into Austria in 1938, and was stationed to invade Poland, though he was recalled back to China just before the invasion began. Some Chinese troops training in Germany in the 1930s stop to play a game of chess. And finally, a more noteworthy story of an American volunteer in the German military is the case of Martin James Monti. A United States Pilot, Monti was sent to a base in Karachi to train Indian pilots. Once there, Monti secretly boarded a plane to Libya, where he then stole a P-38 Lightning and flew to Naples. 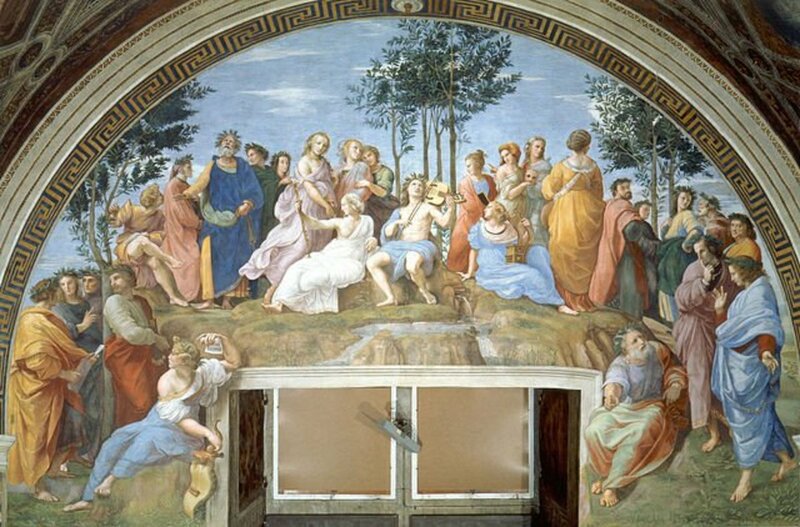 Once in there, Monti defected. 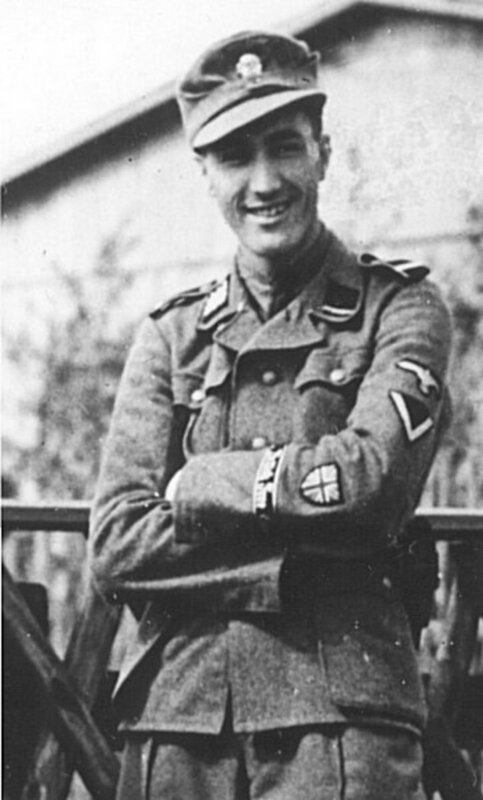 After traveling to Germany, Monti joined the SS, and worked in a propaganda unit. In 1945, Monti was arrested, and charged with treason. While it has been seen that many foreigners in the German military were a result of volunteers, the vast majority of foreigners in the German military were a result of the forced conscription of captured soldiers and occupied peoples. Some of the more well-known conscript divisions was British Frei Korps (free corps). The British Free Corps, known as the Legion of St. George, had around 59 British and British subject POWs join its ranks throughout the war. It is worth noting that members of this British unit were not forced to join outright; rather, leaflets about the division were distributed around POWs camps, making the unit an all volunteer unit. After the war, many of the British members of the unit were tried with treason, though many New Zealand and Canadian members claimed they joined the unit to sabotage it. 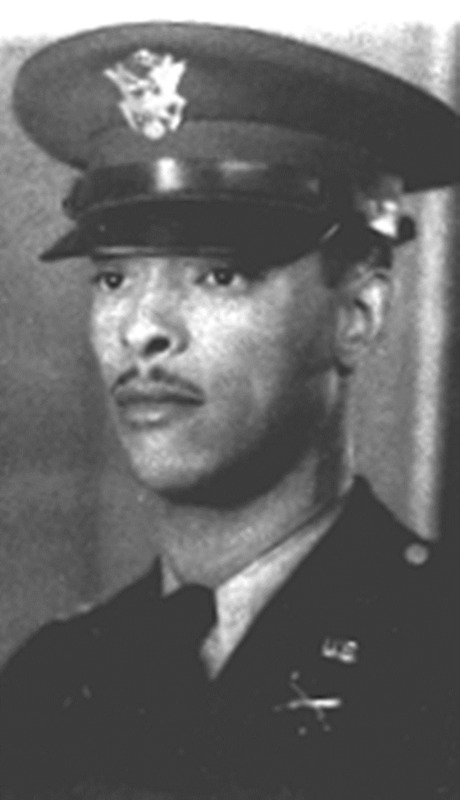 One member, John Avery, was the son of a British Member of Parliament, and was executed in 1945 by the British government. On the other hand, a small portion (around 10 soldiers) of one SS division was composed of American POWs. Not planned by the German government in any official capacity, the division did not see the end of the war as many American members deserted or were shot for doing so. One of the most odd stories of foreign conscripts in the German military were a group of Koreans. On June 6th, 1944, during the Allied invasion of France, an American unit came across a group of Koreans dressed in German uniforms in a bunker. How these Koreans came to France is a sad tale. Sometime after Japan annexed Korea in 1910, these Korean soldiers were conscripted by the Japanese military. During the 1930s, these Korean soldiers fought the Soviet military for Japan during a series of border conflicts. Here, they were captured by the Soviets and conscripted by the Soviet army. 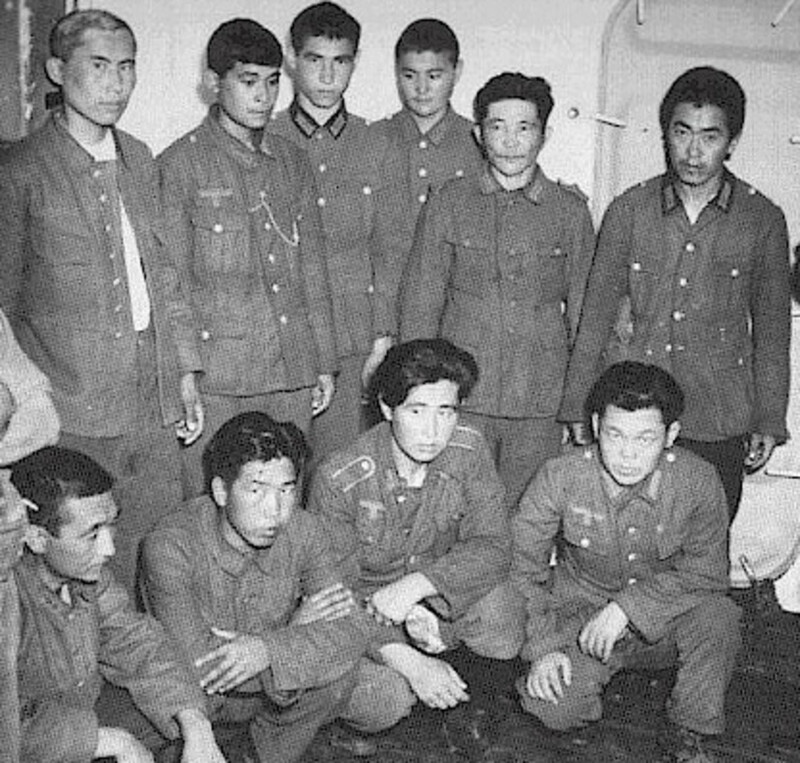 These Koreans then fought Germany after the Soviet Union was invaded, and were subsequently captured by the German Army. These Koreans were then conscripted by the German military and sent to France, where they surrendered to an American unit. Korean soldiers dressed in German army uniforms. They were pressed into service by the Japanese, then the Soviets, then Germany, before being captured by Americans in France. As one can see, war is not as clear as it is often made out to be, for the enemy is not simply defined by a nationality. As in the case of the "German" military, various religions, ethnicity, and nationalities joined either willingly under political reasons, or unwillingly. While in recent years, World War II has taken on the name "The Good War," this title is a false one. The "Good War" adage conjures ideas of dichotomy - good vs. evil. But, we must ask ourselves, was it really so defined? Were the Indian soldiers fighting with the German military against British oppression truly evil? Were the aforementioned Koreans, who were subjugated by the Japanese, Soviets, and Germans evil? In order to adequately grasp history and its lessons, we cannot afford to be so blind, and must think critically about all aspects if we truly wish to learn from the past. Smith, A.L. : The Deutschtum of Nazi Germany and the United States, Martinus Nijhoff, The Hague, 1965. Wagner, Jonathan F.: “Heim ins Reich, the Story of the Loon River Nazis”, in D.H. Bocking (ed. ), Saskatchewan History, Vol. XXIX, Nr. 2 Spring 1976. 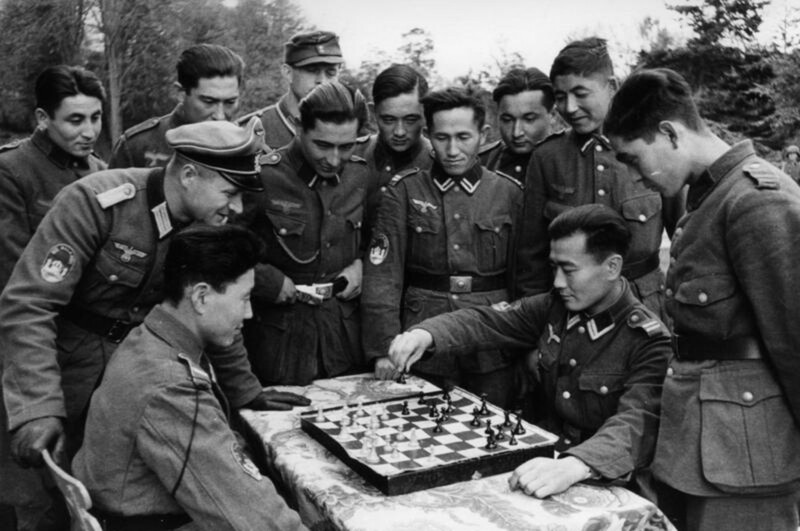 The troops playing a game of chess are not Chinese, but Muslims from Central Asia in the German Army's Turkestan Legion. They were captured by, or deserted to, the Germans during the invasion of the Soviet Union. Amongst the British that joined the SS was a member of M16, who used the opportunity to report information back to London on things like bomb damage. 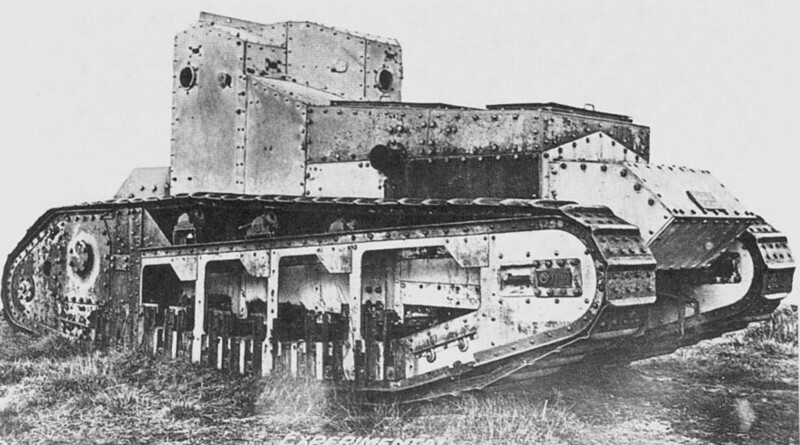 The British unit was disbanded because it was deemed by the Germans to be 'inept'. You forgot the Jews, who actually fought against the Soviets. Interesting article that brought out a whole new way of seeing the war. We would have had to been there to know the whole truth why they joined the German forces. I do believe that communism was hated even worse. I did not know that there were any Americans in Hitler's army. Indeed, very interesting. Voted up and sharing. True tales or not, the above is simply dreadful writing. Foreign Born Nazi Leaders : i.e Adolf Hitler. 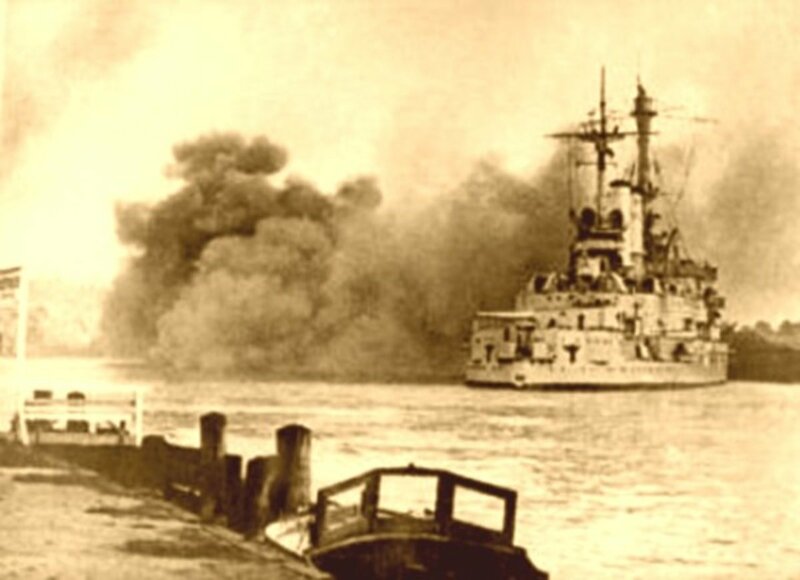 World War II was a global war and, as such not only included some strange alliances between nations but also some strange alliances by individuals. In the case of individuals, there are many factors from self-preservation for themselves and/or families to nationalistic, ethnic or religious reasons for joining the other side in such a war. The American Revolution was another world war in which France and Spain, two absolute monarchies and, in the case of Spain a colonial power whose colonies bordered the American colonies. However, both France and Spain saw the rise of Britain as the world's then leading power a greater threat than a revolt by American colonists seeking independence and a republican form of government - two things that were the opposite of what they stood for. Interesting and informative Hub, thank you for sharing it. Very interesting article-- full of information I was not aware of. Voted up and interesting. BTW, although I'm a Hubber, I came across this using Google search.